Take me out to the ball game! If you are anything like us, then you love visiting the country’s most historic and impressive Ballparks to enjoy America’s favorite pastime…Baseball. 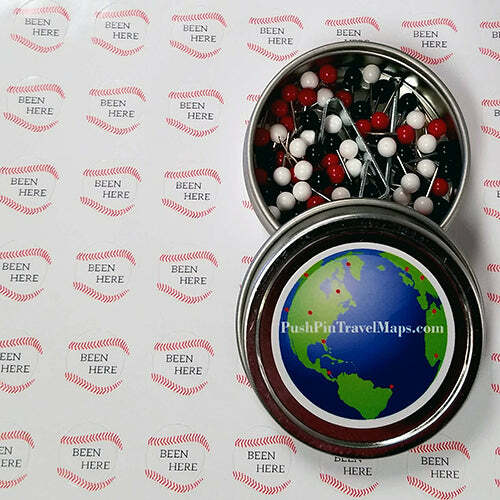 Create your very own Push Pin Travel Map to track your travels with our DIY Baseball Adventures travel map kit. Track all of the baseball stadiums you have visited on your quest to see them all. Our DIY Baseball Stadiums Map has all American League and National League teams’ stadiums in the US and Canada listed and plotted on the map. Once you visit a ballpark, use one of our handy baseball stickers that say “BEEN HERE” and put them in the glove over the ballpark you visited and see if you can “catch” all of the Majors! We also include 100 pins with your order so you can use your Ballpark Travel Map to pin your non baseball travels as well! Our map of baseball stadiums lists all 30 MLB team names sorted by division, stadium names and also stadium capacity in the lower left portion of the map. Your DIY Baseball Stadiums Map can even be personalized with your name, favorite quote, or whatever you want to make it even more unique and personal. This map makes the perfect gift for the baseball enthusiast in your life and is also a great gift for children who are just starting out on their lifelong love of the game. Our DIY Travel Map Kit comes with the 24" x 36" map rolled in a tube, 30 "BEEN HERE" stickers, 100 map pins in a mixture of red, white and black, a personalized plaque and instructions on how to mount and frame the map yourself. Each Ballpark Travel Map comes with a set of 30 “BEEN HERE” baseball stickers to put in the gloves of the stadiums you have visited to signify that you have “caught” that stadium. Our Baseball Stadium Map also comes with 100 pins in a mixture of red, white and black so you can pin your other travels across the continental United States. My husband and I have been traveling to watch our teams at various ballparks. This is a great way to keep track of where we’ve been and to help plan our next trip! I received my map quickly after ordering, and it was packaged up nicely. When I opened my new map, the quality was above my expectations, and the customizable plate is a perfect touch, icing on the cake. I would definitely purchase from them again. Very good quality. Care taken in shipping product. Thank you. Baseball Adventures Map Is A Homerun! I ordered this map for my husband as a surprise. 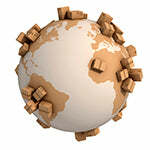 The shipping was extremely fast and it arrived in excellent condition. The map is perfect for baseball lovers - we have already taken it to be framed, which is not much of an added cost. 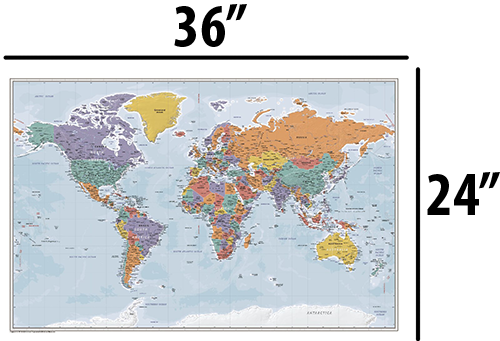 We are so pleased with our first purchase from Push Pin Travel Maps, we are ordering a world map for our daughter and son-in-law stationed in Europe. Thank you for providing a wonderful product made in the USA!